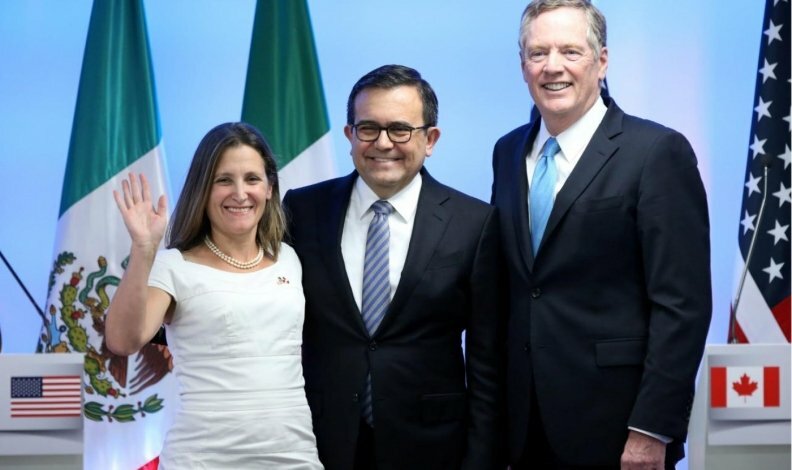 Canadian Foreign Minister Chrystia Freeland, Mexico's Economy Minister Ildefonso Guajardo and U.S. Trade Representative Robert Lighthizer still have serious issues to address if they want a new NAFTA. OTTAWA -- The most contentious issues in talks to renegotiate the North American Free Trade Agreement have not been introduced by the United States, the Canadian foreign minister said Wednesday as the third round of talks between Canada, the United States and Mexico concluded. U.S. Trade Representative Robert Lighthizer said some issues related to small- and medium-size enterprises were resolved, but an enormous amount of work still needs to be done on other, difficult matters. Rules of origin, which greatly affects the automotive industry, and Mexico’s lower wages and lax labour laws have yet to be addressed in detail. Lighthizer said delegates made significant progress on competition policy, digital trade, state-owned enterprises and telecommunications. Details on the treaty chapter they agreed on were not available. Canadian Foreign Minister Chrystia Freeland said that on potentially the most difficult areas the United States has not introduced formal proposals or text. Freeland said Canada can't respond to something that has not been introduced. Mexican Economy Secretary Ildefonso Guajardo also said "substantial challenges" lie ahead. U.S. President Donald Trump has called the 1992 trade deal the worst in history. "We all know that this is an administration that is openly protectionist. It's an administration that speaks quite openly of the America first policy. That is the reality that Canada has to deal with," Freeland said. For example, Washington wants local-content rules tightened to avoid imports largely made in third countries from being considered "made in North America" just because they were assembled in Mexico. Freeland said the U.S. has not introduced a proposal on rules of origin. Mexico's low wages have also become an increasing point of debate. Mexico has drawn plants and investments by capitalizing on low wages and weak union rules, and Mexican business and labour leaders appear to be resistant to any attempt to tighten labour standards or ensure that Mexican wages rise. Mexican and Canadian auto unions have said in a report that Mexican autoworkers earn about $3.95 an hour, which is about one-ninth of average wages north of the border. Lighthizer said the U.S. has an interest in having wages in Mexico go up, the reasoning being that higher wages in Mexico will make it a less attractive place for manufacturing outsourcing. "We are clearly looking at ways with the Mexican negotiators to try to have an impact on the wages in Mexico," he said. A fourth round of negotiations is scheduled for Oct. 11-15 in Washington. Asked if she thinks the United States really wants a deal, Freeland answered: "I do not have the super power that allows me to look into the heart of a counter party and divine their true intention." Dan Ujczo, an Ohio-based international trade lawyer who represents companies in both the U.S. and Canada, said there was pessimism among about 250 stakeholders and negotiators who attended a reception in Ottawa on Tuesday night. "The general mood is not if, but when, we will see a withdrawal [from NAFTA by the U.S.]. My view is likely later this year," Ujczo said.